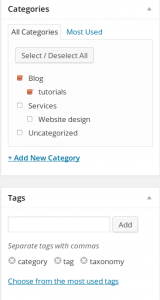 Putting Things in a box: Categories, Tags and Taxonomies. Working with grassroots groups, and being an anarchist myself, I often have trouble putting a label on things. Why should I assign an idea, a person or a thing to a box, and define what he/she is or could potentially be? Is this a manifesto, an article, a tutorial or a rant? For now I’ll just call it a blog. But in learning about web publishing, I’ve realised the importance of organising information in clear, well defined ways, so that what we have to say is not lost forever in the ethernet, or at the bottom of your post archive. There are a lot of blogs that are guilty of this, and even professionally designed websites that confuse users with an array of ill defined categories and tags that lead the visitor to nowhere. Whats brilliant about web publishing, is that we don’t have to subscribe to other peoples labels, but we can make up our own. All the web publishing platforms I’ve used give you the option of assigning a post to a Category or a Tag. And we can use them to organise our websites menus, archives, and even our URLs to make our content easier both for our users and search engines to find. So what is a Category and what is a tag? There are alot of blogs out there that use these interchangeably, and then there’s twitter and facebook users that make up new hashtags #liketheresnotomorrow because #YOLO. But for this discussion we are going to stick with how to use them on websites, and in particular WordPress. Both are used to signal to the user what the theme of the content is about. Both can have archives, so we can list all the posts in a particular tag or category all together in one place. Both can have links to their archive on a menu. Neither categories or tags are particularly useful if there is only ever going to be one item associated with them, or if almost everything on your site is categorised or tagged as the same thing. Tags aren’t hierarchical: #videos #short films #mining #sea bed mining are all independent and on the same level. Ofcourse our natural instinct is to choose the more democratic option, but before we do consider the possibilities. A hierarchy means we can have parent and child categories, and we can say that some categories are created equal, but some are more equal than others. An example is the way we used WordPress categories at freedomflotillawestpapua.org/category/events/ to show people all the events from newest to oldest, in case they wanted to follow us around wherever we were going. Say for example if there were heaps of events going on in other countries, we could even use grandchild categories to list all EVENTS or all events by COUNTRY and then by CITY. Or we could get ridiculous and have greatgrandchildren and add a category to view events by state. But hey we’re anarchists and we don’t believe in national borders, and don’t plan to live that long anyway #YOLO. Tags are more fluid: People tend to add more, which is great for really specific things, but you can quickly end up with duplicate tags like #mining and #mines. This comes down to the way that we assign a post a category or tag. 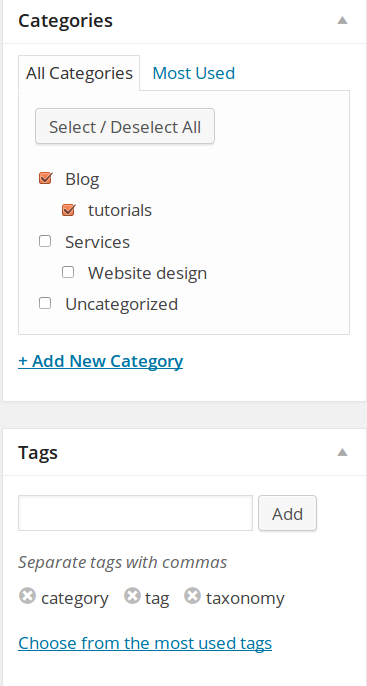 By default, when you go to publish a new post in WordPress, underneath the big blue publish button you’ll have categories with checkboxes that you can tick, and underneath that tags which you will need to enter manually, or click ‘choose from the most used tags. The tags function really encourages users to spell things however they want, and if they are feeling keen to add tags that don’t help define specifically what the content is about eg. #environment – when its quite likely that everything on your blog is related to the environment. Either way its always easy to edit these in the WordPress post editor or using ‘quick edit’. Ultimately, if it doesn’t matter to have parent and child categories, you could decide to use one or the other, or a combination of both (but it is strongly recommended not to double up and use them both interchangeably, as it will make it extra hard for visitors to find your content). Tags are more often used to define more specific themes, eg. is this a B-grade horror or a farcical comedy? Categories are more often used for menu items and custom searches. Tags are more often used to display a tag cloud (pictured) showing the most common themes on a website in bigger letters. But we’ll leave that to another post where we’ll talk about how you might want to use Custom Post Types, Custom Taxonomies, and Custom Fields. For now, the take home message is to be consistent about your use of categories and tags, decide what works best for your site and stick with it. Always keep in mind what is it that visitors are likely to be searching for on your site, and if you are finding that it is getting out of control we can help to find ways to solve it.